“Distance Work” is not just a matter of whether a dog will work at a distance. The handler must have the skill to shape the dog’s path to frame the distance presentation. Sometimes the wise words of an old golfing buddy of mine occur to me as I watch someone spoiling a line of approach for a distance send; he would say to me “Have you ever tried aiming”? The handler should view the available real estate leading into the distance challenge as a canvas upon which he will paint the shaping movement which most ideally frames the path ahead. The handler should also understand the attributes of movement. An “attribute” is the expected result or yield of a movement as it impacts the dog’s path or speed. A common mistake a handler might make in contemplating distance work is the belief that working a dog at a distance has anything to do with the handler stopping while the dog goes on. If anything the handler’s movement at a distance must be a true and constant application of pressure that helps direct the dog and to answer the ever-present question… where to next? 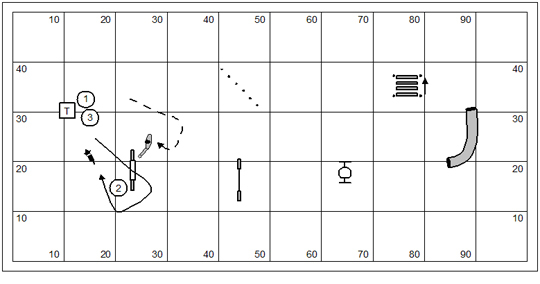 In this drawing the red line indicates the handler’s containment while the dog performs obstacles #3 through #6. Aside from just the sequencing performance the handler should ask the dog to lie down for a count of five seconds while remaining behind the containment line. Note that the handler starts snug with the dog on the dismount of the dogwalk. If you think about it the handler wants the dog to get ahead so that he can step behind the dog on the landing side of jump #2. Most handlers will be closely trapped to the dog on the dismount of the dogwalk in any case. 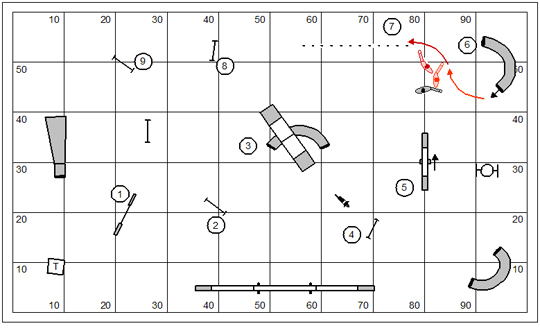 The path after jump #2 is deliberately drawn to show the hard Post the handler shows the dog after the jump. Just as the dog slides past the handler’s position the handler will push in the turn to the right (the Tandem). 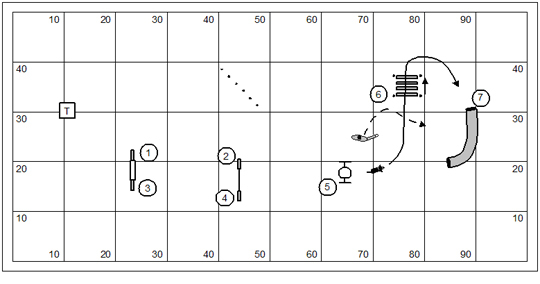 The dog’s turning position constitutes the corner of approach to jump #3 and consequently on to the pipe tunnel at #4. Two attributes of the Tandem Turn should be noted. 1) The Tandem creates a wide sweeping turn; 2) The Tandem accelerates the dog. We want both of these attributes in the turn. 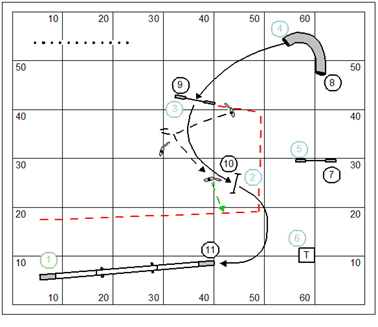 The wide sweeping corner opens up the approach to jump #3 and brings the dog around to a more logical line to the pipe tunnel. Acceleration is desirable too as it gives impulsion and motive for sending the dog on. The straight-ahead send can be problematic, and more difficult than it looks. The handler must endeavor to drive from behind as much as possible. In this drawing the handler sets up for a Front Cross on the landing side of jump #9. Note that the station for the Cross might have been much nearer to jump #10 if this were a routine handling sequence. But because the handler has a compelling interest in sending the dog ahead at some point, he will want to reserve as much real estate for movement as possible. This is a simple Front Cross but must be executed in the anticipation of a speed change (from forward of the dog to behind the dog). 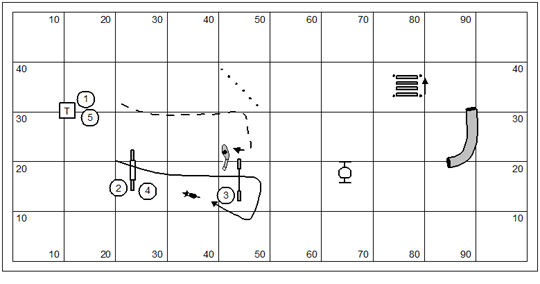 So out of the rotation the handler will need steps toward jump #10 to indicate the path and straighten the line… but the dog must get ahead of the handler as soon as possible, and well before getting to jump #10. This is an excellent opportunity for the handler to shorten stride without taking off any sense of urgency or making a show of putting on the brakes. The difficulty with the turn from jump #10 to the dogwalk is that the dog will have a good look at the table which is directly on his path. So the handler might give a little call to the dog to get him to look back. Note that I’ve draw the handler facing the ascent ramp of the dogwalk; he’s also tucked up behind the wing of the jump, reserving a couple of strong steps (line shown in green) to get the dog out to the dogwalk. I omitted any discussion of the send to the pipe tunnel from the table with the handler held at some distance by our containment lines. This is probably solved by a simple parallel path presentation of the jump. The handler wants to establish the parallel path before releasing the dog. On the other hand, the handler doesn’t really want to exhaust all of his real estate for movement before releasing the dog. You may find that the difficulty in this exercise is getting the dog to lie down with the handler at a distance, and maintaining the down position when the handler begins to move. Clearly this discipline is the subject of a training program all by itself. I haven’t written to the blog in several days. I had folks up here from Cincinnati in a private camp. And when that was over I just goofed off a couple days. I’m having fun being outside; and that takes me away from the computer. The next couple of months I’ll be running around like a blind dog in a meat house; but this week offers a nice slow pace in a fine start to the summer. Okay for today’s blog I posted something that’s been laying around for awhile and have published before. It was an accident. I transposed the numbers in the filename (the filename is always at the bottom of the post). The scary part about what I did is that I edited the piece and didn’t for a moment reflect that this wasn’t something I wrote just a few days ago. Well, I’ll share that one with you tomorrow. I’ve been thinking about the tornadoes; especially that terrible thing that hit Joplin. Do you have a dog, or have you ever had one, that trembles at the thunder and lightning outside? You can try to console such a dog; but he’ll look right through you, haunted by a terrible foreboding. We try to tell our children that there are no monsters in the world. But it’s just a soothing fib. There’re monsters everywhere. In The Great Gatsby Myrtle asks to buy a police dog from a guy selling dogs in the train station. But he only had one breed. What was it? Precue a turn out of the collapsed tunnel? One of the things I was trying to do in Boise is take away the lead-out so that leading out was irrelevant. I want to share the opening of my Grand Prix course to discuss an interesting serpentine opening. For the most part the dog’s path we got in this opening is dramatized by the red line in this drawing. I had envisioned a dog’s path rather more like the black line. There is a very real difference of nearly 7 yards in these two paths. Agility is a game that is won and lost in that expanse of real estate between the obstacles that we refer to as “the flat”. Contests are won and lost in the efficiency of the dog’s path. I am not one to recycle a lot of courses when I judge. I have a lot of things jangling around in my head that I want to submit to the real world for testing. And while I may occasionally suffer from designers remorse; mostly I’m gratified by giving an abstract idea a good workout in competition. The salient factors of this opening are obvious (I’ll share the whole course with you below). The dog in the tunnel isn’t much privy to the movement antics of the handler while he’s involved in the performance. Yeah, he doesn’t see a thing. After he blows out of the collapsed tunnel it might take him several full seconds to bring the handler’s cues as to a new direction into focus and respond to them. Consequently it’s easy to add way too much length to the consequential path. What I really want to test now, is the backy-uppy precue presentation of the collapsed tunnel. If this really works we can expect a bit of yaw in the tunnel fabric as the dog comes out already dedicated to the change of directions. I’ve already established that this cue is natural and intuitive for dogs going into a pipe tunnel; so, why not the collapsed tunnel. In this drawing, by the way, I show the handler set up to ensure the more efficient turn on the landing side of jump #2 using a Tandem Turn. Frankly, a good Front Cross might work admirably well. I may use this course again some day; though I might put it up as a standard course. That means I’d have to spoil it a bit by putting a table out there somewheres. There’s no question about it… the table would have to go at #11. This week we have a private camp here at Country Dream. We’re pretty much stopped scheduling open camps. Guessing at the best dates is really problematic. What we’ve found is that it’s much easier for a group of like-minded people can coordinate with each other as to their dates, and then work with us to get something special for them on the calendar. Private camps are lovely and customizable events that public camps can never be. I’m also trying to get caught up on my chores and other obligations. Questions comments & impassioned speeches to Bud Houston BudHouston@hughes.net. The Country Dream web store is up and running www.dogagility.org/newstore. On Saturday in Boise it got up to about 80˚. It was a beautiful day in an absolutely gorgeous high desert haven. On Sunday it got down to about 60˚ and got overcast with a blustery wind. It rained all night on Sunday; and by Monday morning it was dreadful cold with mushy snow. Naturally I hadn’t packed any winter gear… it is May, after all. But still Boise gives you that grand big sky feeling like you’re standing on the top of the world. I wonder if the folks up there feel the majesty of the amazingly beautiful place they live. 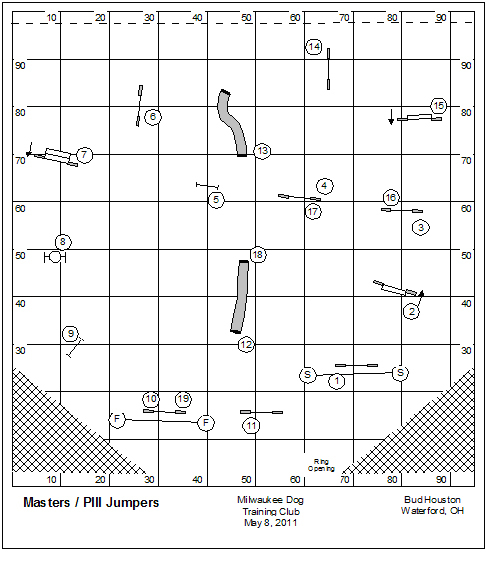 In the Sunday Masters Jumpers course the turning direction riddle comes mid-course. It begins with the serpentine #7-8-9, into the transition #10-11-12. Jump #9 is the decision jump. Given the direction of approach a left turn is the natural turning direction. In terms of risk turning to the right offers three wrong course options (remembering to include the back-jump potential). Turning to the left there’s nothing but blue skies. The better consequential path is almost certainly a turn to the right. The dog, being turned neatly, can be released into a long straight line up to the pipe tunnel at #12. Turning to the left is a zig-zagging adventure fraught with peril. 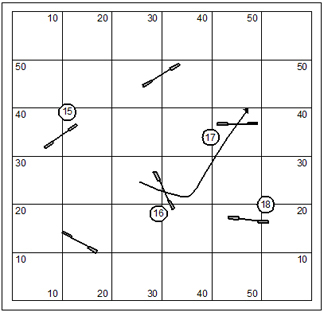 Which direction is accommodated by the skills of the dog and handler team? For the dog turning right: The handler probably should be able to draw the dog in a tight wrapping post to give a little right-leaning influence for the send to the tunnel. The handler could also put the dog on right with a serpentine Front Cross. Though he’ll have to be careful not to be too flat-footed as the dog draws past. Otherwise the dog might very well wrap back to the left going forward and spoil the send to the tunnel. For the dog turning left: if the handler comes through this turn with dog on right, it’s going to be ugly and wobbly and unmanageable (most likely). With dog on left it will be a sweeter turn but might very well leave the handler OOP for downstream control and pressure. I do apologize if the skills analysis seems cryptic. When speaking of dog and handler skills I’ve afraid I’ve got my own language these days. If 100 handlers and dogs ran the jumpers course above… which would be the more successful turning direction at jump #9? Which is the natural turning direction? Which provides the better consequential path? Which is accommodated by the skills of the dog and handler team? In Boise this past weekend I put up two Masters Jumpers courses that each posed a choice of turning direction riddle. 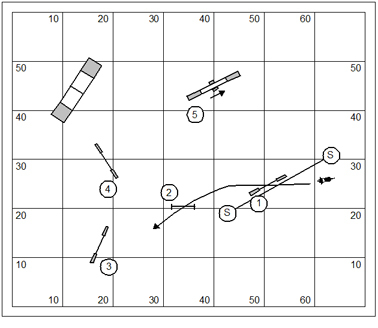 On the Friday Jumpers course the sequence you should look at is #15 through #19. The jump that poses the turning direction riddle is #17. To determine the natural turning direction all you have to do is plot the line of the dog’s approach. 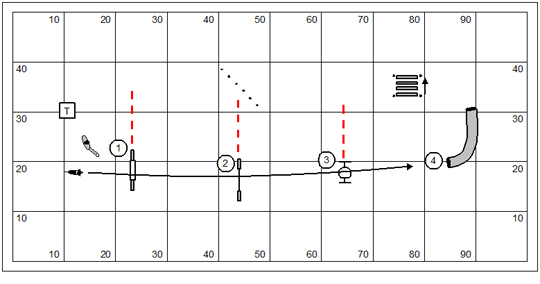 You can see that the line leans to the right at jump #17. So the right would be the natural turning direction. Turning to the right also offers less risk. To the right there is nothing but blue skies. If we turn the dog to the left he will get a good look at no less than four wrong course options; the chances of dropping the bar are also greater. 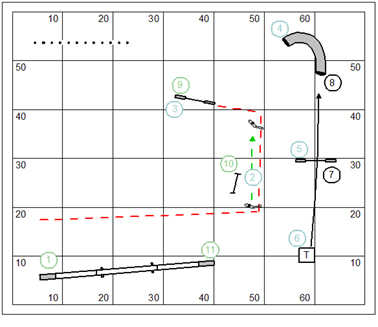 Note: if you saw only three wrong course options you failed to include back-jumping #17… and that is the wrong course most likely when fighting against the natural turning direction. The better consequential path is also to the right. This gives the dog a straight line through the final two hurdles. A turn to the left is not terrible bad; but is is slightly longer and not a straight line at all. In terms of skill turning to the left requires no more than a serpentine Front Cross. 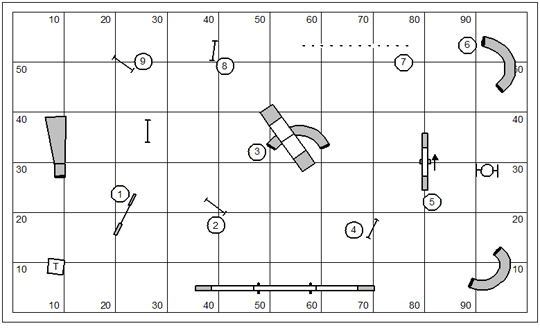 First the handler draws the dog to the left on Post and then turns back in a Front Cross to finish the course. Note: not recognizing the moment of the Post is what causes the dog to back-jump the #17 jump. Turning the dog to the right is more problematic. If the handler can get forward of the dog this is a simple Post Turn. But if the handler is behind the dog the team is faced with a somewhat more treacherous Back Cross. I’ll discuss the Sunday Masters Jumpers course tomorrow. If 100 handlers and dogs ran the jumpers course above… which would be the more successful turning direction at jump #17? There’s nothing like a couple sessions of Back Cross exercises before my students forget that they have more intrepid skills and fall into the sloppy comfort of fast dog handling (behind and pushing). 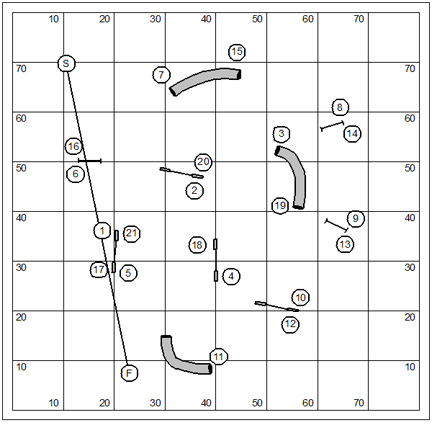 In this sequence I can predict that certain of my students will figure out how to find three Back Crosses in this simple 9 obstacle sequence. Do you see how it would go? 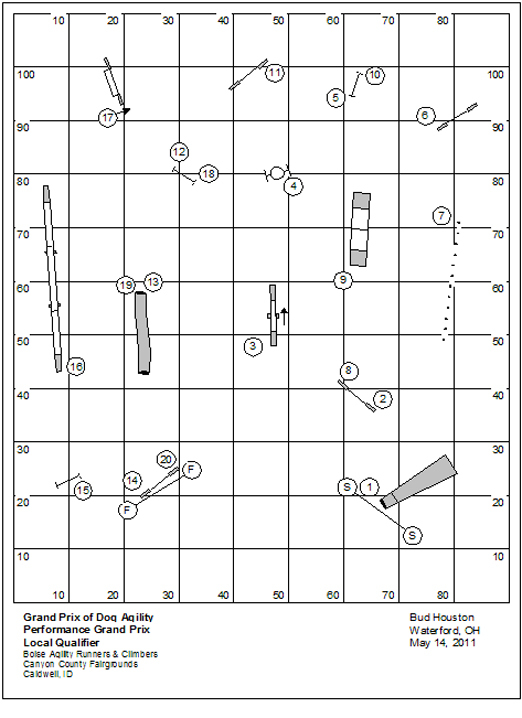 Dog on right to the pipe tunnel at #3 ~ Back Cross; Dog on left to jump #4 ~ Back Cross; Dog on right past the dismount of the teeter ~ Tandem on-the-flat (a form of the Back Cross). There you have it. The first rule of boot camp is: No Back Crosses. I’ll remind my students of the rule and then have another go at the sequence. What we get to see next is a couple Front Crosses mostly in toe-to-toe two-step with the dog. The Exercise As a reminder… the dog turns when the handler turns. It all gets a bit sloppy when the dog turns where the handler turns. So in this opening the handler leads out very deep to a control position for downstream events. I’ve tried to use colors here to demonstrate the timing events for the Cross. The handler begins the rotation as his dog is in the air at jump #2; and continues to fold back with a nice Jenny Damm pulling hand. This is, frankly, much easier than it looks. The problematic thing might be that if the dog has no stay, then the handler doesn’t get to practice long lead outs. Frankly pushing to the landing side of jump #4 for a Front Cross gives a lot of pressure towards the wrong-course pipe tunnel and has the handler tangled up with the dog (in real estate that the dog should own). What I’d really like to play with in the vicinity of the teeter is drawing the dog to the performance of the teeter from the tipping side in a technical Front Cross. You know, a Front Cross on the dismount of a pipe tunnel is a matter of real discipline and timing. Note in this drawing that the handler reserves the entire rotation of the Cross until the dog initially pokes his nose out of the tunnel. Good movement is wasted on a dog in the tunnel (because he can’t actually see the movement). So the handler has stored up all his rotation, like potential energy, and at the moment of the Cross releases that energy to pull the dog in a nice tight line towards the weave poles (or will make it slightly serpentine to create more of a square approach if the dog actually needs that). There’s a fairly new science fiction movie out based on a story by one of my favorite science fiction writers. He was also the author of another book on which a popular cult movie hit was based (something like 20 years ago, I’d think). In that movie there was a curse on companies that had product placement; (Atari, Cuisinart, Pan Am, Ma Bell… I can’t really remember the whole list). Who’s the author? What are the movies to which I’m referring? And… what was the name of the book on which the cursed movie was based? This first bit is a proofing exercise for progressive sending. I’d like to be able to send my dog down a long line of obstacles while staying a considerable distance behind. This would make a fun game… played rather like a game of golf. The score we earn with the dog depends on the length of the send. If the handler can send the dog on to the pipe tunnel while remaining behind jump #1, then the dog’s score would be 1. If the handler has to run all the way to the landing side of the tire, then the dog’s score would be 4. Lowest score wins. Time is a tie-breaker. 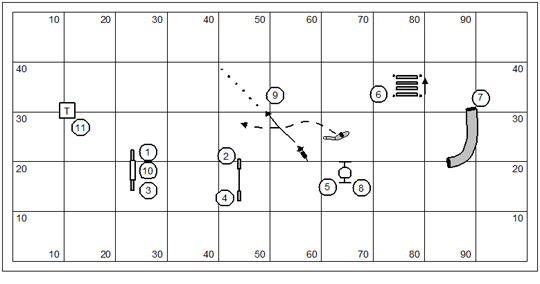 Then again, if a dog (or an entire class) isn’t ready for a proofing game, you might consider turning this into a training exercise; starting very near the tunnel while sending the dog forward to get in, and backing up very gradually between repetitions. A baited target-plate on the dismount of the tunnel might be a good idea to give the dog incentive to leave his handler behind. The services of a bait master would be highly desirable to deny the dog the prize if he cheats and runs past the tunnel entry to make a bee-line for the foot treat. Okay, after carefully conditioning the dog to blast down the line of hurdles we’ll now ask him not to do so. 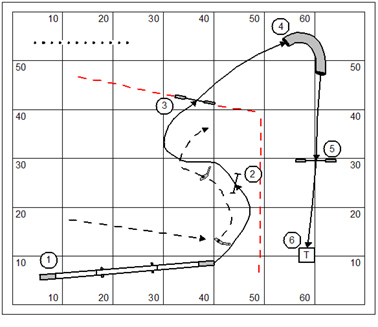 Instead, we’ll practice and proof turning the dog away and back using Back Crosses and the layered Tandem turn. 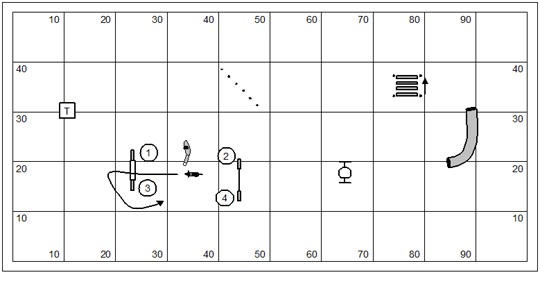 In these exercises the handler should be using verbal directionals tell the dog when and where to turn. If the handler uses absolute directionals then a “Right” command is about all that is required in this exercise. Otherwise the handler will use the relative directional reserved for that moment (I use the word “Turn” when working with relative directionals). In this first proofing test the handler will turn the dog away and back after jump #3. Note that the handler approaches the jump from a healthy lateral distance. This gives him room to show both the turn and support the dog wrapping back. The handler’s path is an interesting parallel image to the dog’s desired path. If a dog isn’t ready for a layered Tandem, the handler should do a full Tandem, crossing on the landing side of the jump. The same layered Tandem at the tire really isn’t the same at all. The pipe tunnel is looming with magnetic appeal to the dog. Also there are some who believe that the tire shouldn’t be a focus for hard-aback turning. I clearly disagree. I want my dogs to be thoughtful masters of the tire and so I will approach the obstacle with the practice of a variety of approaches and dismounts. 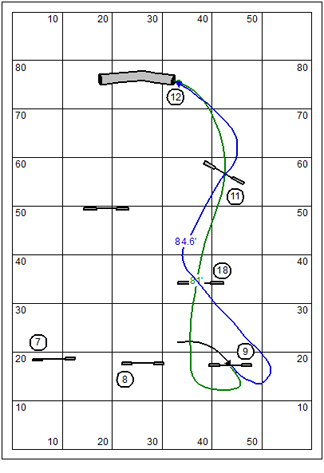 If you want to make the exercise more interesting, have another go at the game Dirty Trick Golf before engaging in this proofing step. The dynamics of the turn at the first jump are essentially the same… however the angle of approach is different, to the tune of about 45˚. Some handlers will square up to the illusion of the straight line going to the pipe tunnel here, and foil the dog’s approach to the first jump. What is the term, coined by German Romanticists, that is used to describe the collective conscious or spirit of an era? When I got the judging invite I pictured an out of doors trial on shocking blue grass. But no, it’s inside on dirt; and the dirt is just brown. I could kick myself as I didn’t wear my brown shoes… but my nice white New Balance again. I’ll be heading back this way in September for seminar work. The topic is undecided in a tug-of-war between distance training and handler training. It’s good be the judge here in advance of the seminar because I get a pretty good look at what I have to work with (and work on). It’s funny; communities of agility players generally tend to have the same strengths and weaknesses. This course opening comes from Advanced standard. Masters really wasn’t that much different. 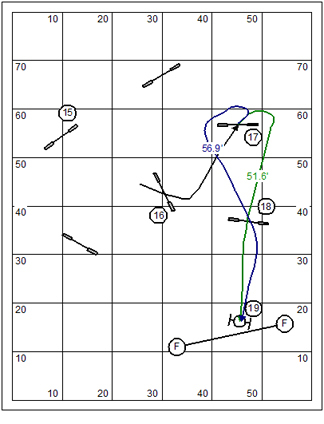 What we’re studying here is the pre-cue Front Cross in the opening. You see how it works. 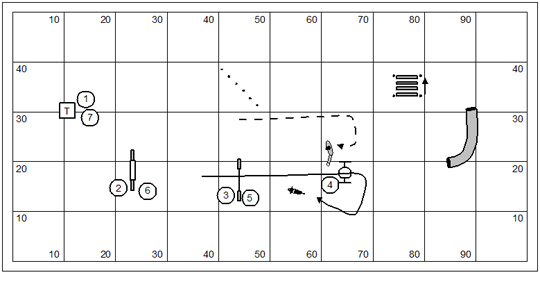 The handler leaves the dog addressing the jump and then leads out to turn back and face the dog showing the lead change as the turning pre‑cue. Okay, I’ve been engrossed in the study of this for many years now. 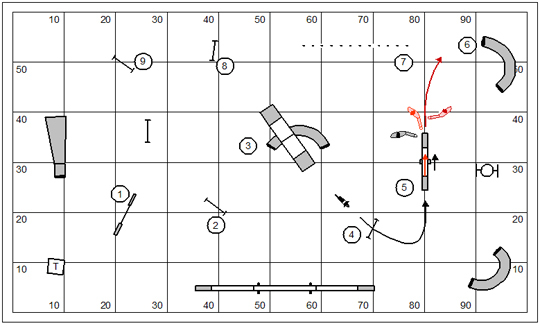 The black line dog’s path is what typically happens with the dog in the transition between the first two jumps. The red line is what would happen if the pre-cue actually worked. Having said that… I should admit that this look at the pre-cue Front Cross does work with a few dogs, but not the majority. Not to belabor the obvious or anything, what was really wrong with the picture is the handler setting the dog up square to jump #1 rather than lined up with the direction of the course as I’m showing here. There’s more than one handling option to get this done. 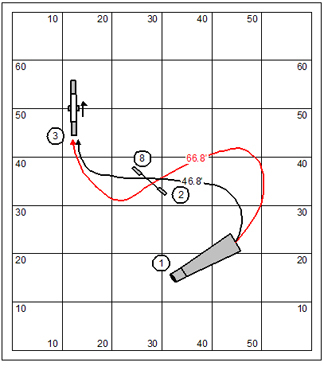 If the handler really wants to pre-cue a turn, it should be at jump #3… not at jump #1. What city or town is notoriously (and exactly) 26 miles from Athens Greece? If it don’t work, it ain’t showing off. 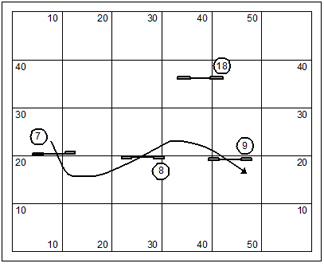 The Rear Cross is about the most technical simplex movement in agility. The bottom line on the movement is that it’s fraught with peril. 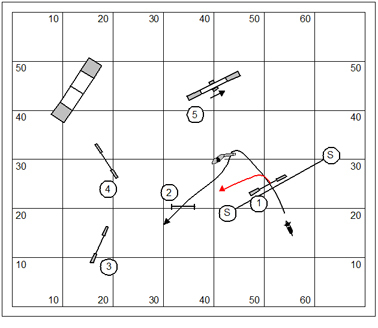 It is a movement that appears to appeal to the logic of the very novice player in dog agility. The novice handler will persistently cling to the movement as a routine tool in spite of the fact that it will result NQ and disaster so often. So it is my custom to beat the Rear Cross out of my novice students and then teach it to my advanced students. All of the exercises in this suite will begin with this four jump sequence which will serve as a preamble to the continuing sequence. At jumps #1, 2 and 3 the handler is required to Rear Cross the dog. Note that this can be tedious and slightly oppressive as the real estate for handler movement is constrained while the dog is required to move in a more robust path; and so if the dog requires input from the handler’s movement for basic motive and direction his response might be less than enthusiastic. That is the nature of the Rear Cross. It is behind and pushing, by definition fast dog handling. Back Crossing the dog at a long jump seems risky, to be sure; though it’s useful to remember that all skills are earned (or deserved) through training and practice. Certainly this is less of a “counterintuitive” exercise than the long jump in obedience in which the handler is required to stand still like a stump in the swamp and face the wrong direction. I’m very interested in a pre-cue turning directive here. So I’ll want to give the “Jump Right!” directive while he’s on the approach to the long jump. If all else fails I can do a bit of dog training here and give him lavish reward (a game of tug, as it were, with a big long sherpa snake with a tennis ball head) for clearing the span of the long jump while rolling diligently into the turn. 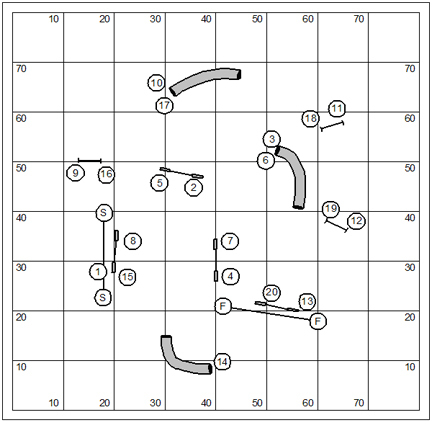 We’ll continue forward-chaining the sequence to include a Back Cross at the weave poles. The handler has a compelling interest in getting on the dog’s left side for the sharp turn to the double-bar hurdle after the weave poles. We could accomplish this with a Front Cross after the tire… but then, we wouldn’t be practicing our Back Crosses. Note that this Back Cross should be as unobtrusive as possible. The handler should usher the dog past his position and then slide up on the dog’s left shoulder before the dog is aware that the handler has crossed at all. Last weekend in Milwaukee… watching a field of 25 fast and well-trained Border Collies and their handlers, it strikes me that among them I’ll be just another face in the crowd (and not a particularly pretty one). Those things that distinguish the team, in such a field, include: athletic prowess; training foundation; technical execution; and boldness. The boldness bullet is uppermost in my thinking. I got a good look at Diane Sanders on the weekend; a woman who is apparently a top player in the Milwaukee area. What really differentiated her from most of the field is that she doesn’t engage in “survival” handling. She’s all attack and damn the torpedoes. I’d like to say that I teach a bold attack style of agility. In truth you can’t teach boldness. It is a state of mind. When teaching I will almost always show how to attack a sequence. It is ever the second and unconsidered option. The key to aggressive play is trusting the dog and releasing him to work; inserting the handler only in those small rare moments of controlled direction; and then getting the hell out of the dog’s way. I’ll tell my students stop handling; stop talking; don’t sit on the dog. How is such advice translated into practical strategy and movement? How does it become a style of play? This weekend (as I write this) I’m in Boise, ID judging USDAA. I fell out of bed early in the morning to compose this note. I’m sure to share with you some of the fun we have on the weekend. It promises to be a grueling thing (for the judge) as there are something like 12 classes a day which means I have to work my arse off so that it’s not a long and tedious day of course building and lollygagging. I’m hoping I have a cracker jack course building crew. When I travel I often see the abbreviation “LPF” in the airport. What does it mean? And what other abbreviation usually accompanies it? I begin writing this from the airport La Quinta in Milwaukee (pronounced M’waukee in these parts). I spent the weekend judging for the Milwaukee Dog Training club. It’s a wonderful community of competitors in this part of the world. The club was organized and took good care of me. USDAA has been somewhat on the decline in recent years around here. I suppose that CPE has a larger draw on the recreational player; and of course AKC dominates the attention of the serious player. Anyhow, I thought I’d share with you the Masters Jumpers course I put up on Sunday. This was just too much fun. I’m not sure I’ve ever designed a Jumpers course that was so raucous and plain fun to run. It had a wonderful spectator appeal and had them cheering and carrying on in the stands. 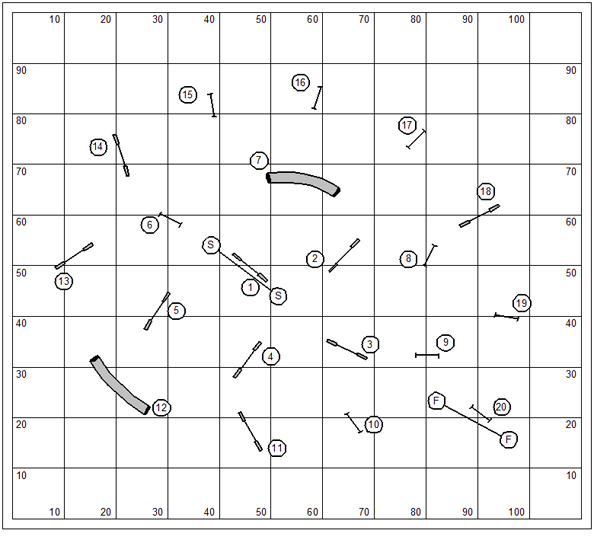 My inspiration for this course comes from South African course design where they can be quite playful with the use of tunnels. 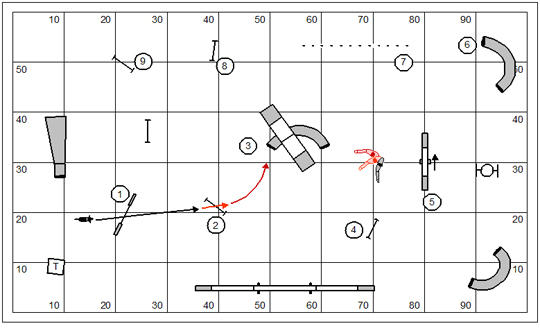 In this course what obstacle was the dog was most likely to earn a fault? And, what was commonly the fault? The classic design for Helter Skelter is faithful to the idea of a children’s playground slide that begins in a tight spiral and unwinds into loops of greater and greater size building a dizzying speed. With only one number to an obstacle the classic design can be a bit of a space hog. There is no prohibition against using contact obstacles or weave poles in a Helter Skelter course; Though the course designer should be aware that technical obstacles will drag on the dog’s speed and probably work against the building speed. And they take up even more real estate. The classic design lends itself to using all manner of specialty hurdles (the tire, spread hurdles, and the long jump). The down and back design begins with an unwinding spiral; but then turns the dog around and rewinds back into the center. 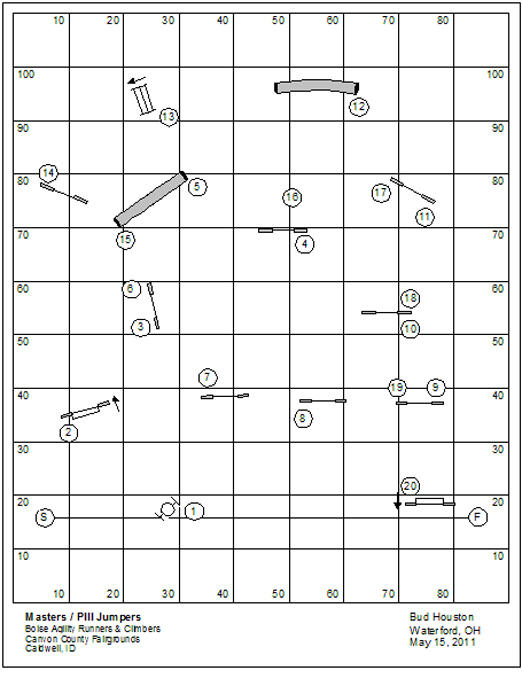 This design has the advantage of using half as many obstacles as the classic design and can be played in about half the space. The down and back design adds a bit challenge in that the dog that has been wound up for nearly reckless speed has to be geared down for a more tightly turning sequence. This design prohibits the use of one-directional obstacles like the teeter, the collapsed tunnel, and certain hurdles. The double-whip design for Helter Skelter remains a bit more faithful to the classic design model. The course begins with a tight inner sequence which is repeated and resumes with a considerably bigger outside loop which is also repeated. This design doubles the obstacle count without doubling the number of obstacles. I’m really telling my age here: What artist is credited with the introduction of the organ as a jazz / rock ‘n roll instrument? What model did he use? What is/was his theme song? I’ll give you one solid hint: Memphis. You are currently browsing the Bud Houston's Blog blog archives for May, 2011.